One of my grandmother's name was Anita she taught me to fight to the last breath. The other was Claudina she taught me to reach higher. My American grandma Libby taught me humor... ... and that we should print funny cartoons the size of posters and hang them on the bathroom wall. 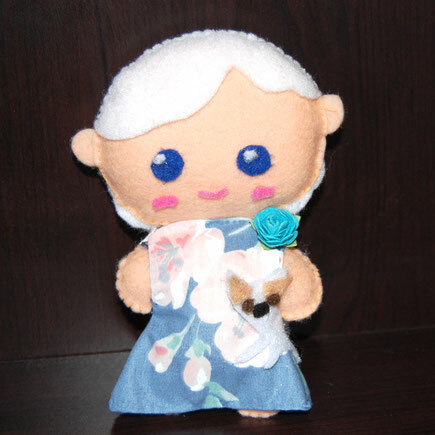 Here is one of them as a doll. It's a hobby to help me take a break from work until I start fighting again. I use scraps, rags and anything I find that I don't want to wast. You can see more dolls here. Uma das minhas avos chamava-se Anita. Ela ensinou-me a lutar ate ao ultimo folego. A outra chamava-se Claudina e ensinou-me a alcancar mais longe. ... e que devemos imprimir comics em tamanho poster e pendurar na parede da casa de banho. Podem ver mais bonecas aqui. Eu tento usar retalhos e tudo o que eu poder apanhar para nao desperdicar nada.